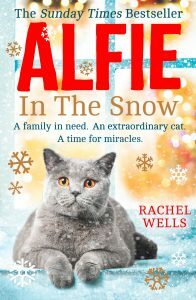 Win a signed copy of Alfie In The Snow & a treat for your cat! To celebrate both the release of Alfie In The Snow and as part of #AdventingAuthors festive calendar with Tracy Buchanan we are giving away a signed copy of ALFIE IN THE SNOW plus a festive treat for your cat. If you want to enter, simply either comment on this post or email me at hello@rachelwells.co with the word #win. Prize will be drawn on 15th December! Can Alfie and George save Christmas?